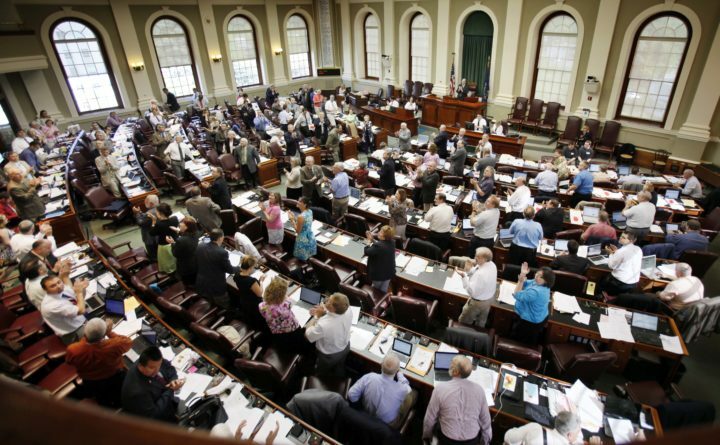 In this June 9, 2011 photo, legislators stand and applaud in the House chamber at the State House in Augusta, Maine. November ballots for the Legislature became clearer Tuesday, with the conclusion of numerous legislative primaries. There were 26 primary contests for seats in the Legislature. In the Senate, all six were among Democrats. In the House, there were 13 Democratic primaries and seven among Republican candidates. Some of the most interesting primaries involved sitting lawmakers. There were two Democratic primaries for seats representing Portland. First-term Rep. Heather Sanborn, D-Portland, fended off Portland City Councilor Jill Duson to earn the party’s nomination to run for a reliably safe Democratic Maine Senate seat. Sanborn will run against Patrick Martin of Westbrook for the open seat left by Sen. Mark Dion, D-Portland, who gave it up to run for governor. First-term Rep. Rachel Talbot Ross, a Democrat representing Portland’s District 40, easily rebuffed a primary challenge from former Rep. Herb Adams, whom she defeated by just 28 votes in a three-way primary in 2016. There is no Republican candidate on the November general election ballot. There was also heightened interest in the Turner-area House District 75 seat formerly held by Republican Rep. Jeff Timberlake, who is term-limited out of his seat and is running for the Senate. Three Republicans from Turner — Angelo Terreri, Alexander Pape and Joshua Morris — are vying to run against former Democratic Sen. John Nutting of Leeds. This is the only legislative race potentially being decided by ranked-choice voting this year, though Morris held a healthy lead and 55 percent support at around 1 a.m. Wednesday. In House District 109 in Waterville, Bruce White beat Charles Ferris for the Democratic nomination. White will face Republican Karen Rancourt-Thomas in the general election for the seat held by Rep. Thomas Longstaff. In House District 110, which includes parts of Oakland and parts of Waterville, Mark Andre beat Jacob Imes by seven votes for the Republican nod and opportunity to run against incumbent Democratic Rep. Colleen Madigan. For a Hancock County Senate seat, four-term Rep. Louis Luchini of Ellsworth faced off against fellow Democrat Ian Schwarz of Mount Desert for the Senate District 7 seat currently held by Republican Sen. Brian Langley of Ellsworth, who is term-limited out of office. Luchini held a commanding lead with 13 or 27 precincts reporting. He will likely face off in November against Republican Rep. Richard Malaby of Hancock, who is also term-limited out of office. For a Waldo County Senate seat, House Majority Leader Erin Herbig, D-Belfast, held a commanding lead over challenger Joseph Greenier of Stockton Springs and will likely face Republican Jayne Giles of Belfast for the seat current held by term-limited Senate President Mike Thibodeau of Winterport. In House District 12 in Biddeford, Democrat Victoria Foley of Biddeford defeated John Eder, also of Biddeford. There is no Republican on the November general election ballot. In House District 13 in Old Orchard Beach, Democrat Lori Gramlich beat Jay Kelley for the right to run against Republican Sharri MacDonald in November. In House District 30, Anne Carney of Cape Elizabeth defeated Mary Ann Lynch for the Democratic nomination. Carney will face off against Republican Charles Rich in the November general election for the seat currently held by Democratic Rep. Kimberly Monaghan. In House District 42 in Portland, Democrat Benjamin Collings beat April Fournier for the right to run against Republican Susan Abercrombie in November. Several other legislative primaries remained up in the air because not all precincts had reported results early Wednesday afternoon.